The term Pontoon refers to 2 different blackjack variants – a variation played across Australia, Singapore, and Malaysia, and a more traditional variance found within the borders of the United Kingdom, with local equivalents for the commonly used blackjack commands “Hit” and “Stand”. If seated at a table packed with Brits and Aussies, you are much more likely to hear Twist and Stick instead of Hit and Stand. Pontoon can be compared with Spanish 21, as it is played without the 10s. Another “peculiarity” is that this form of blackjack tends to keep the dealer’s cards a mystery, which significantly changes both the odds and the dynamics of the game. This is the way Pontoon looks at GTBets. We’ll talk about this more in a minute, but look at this. I just won 10 bucks for doing nothing but being dealt a “16”. Pretty sweet! Ties or Push does not exist in Pontoon and the dealer will win on all hands of equal value. For example, if both the player and the dealer have natural Blackjack, dealer’s hand will outrank the player’s hand. The same goes for the five-card trick hand. Any dealer’s hand with five cards that does not bust will trump the player’s five card, even if it’s higher in value. In other words, if you have five cards with a total of 21 and the dealer has five cards with a total of 20, the house wins. Look at the table down toward the bottom. What would you do? Another major difference between typical blackjack and Pontoon is that the later comes with a threshold. Any hand that’s under 15 will not be considered as valid, which means that the players are not allowed to “Stick” on hands with a total that’s lower than the qualifying value. 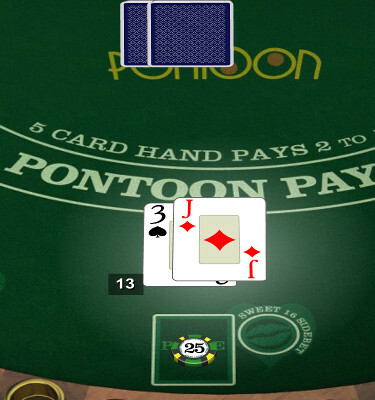 As mentioned, the dealer’s cards in Pontoon are not exposed and the player’s first card is dealt face down. After the first bets are submitted, the second card is dealt, and the hands are revealed. 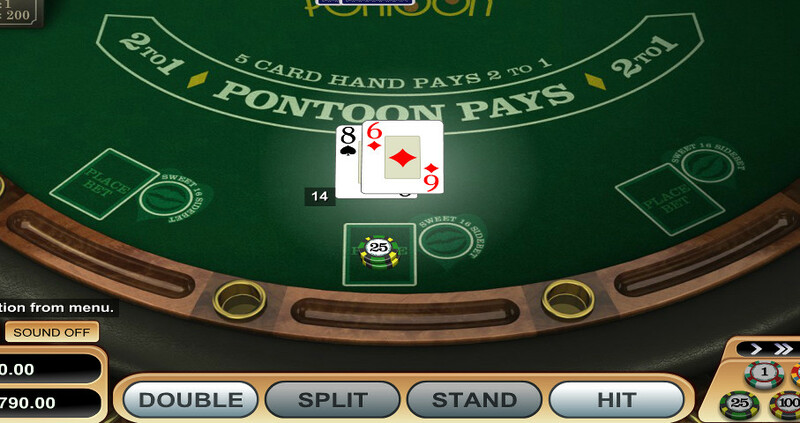 Dealer’s Pontoon will automatically win, otherwise, the bets are settled in favor of the players who landed a natural Pontoon (A + any face card) or 21. Players with a hand that’s under 21 can also buy additional cards. To do that, one will need to match the original bet or double the amount. The process can be repeated if you are still under 21 after purchasing the card. Cards cannot be purchased after the player has decided to Twist – whichever your initial move was, it would have to be continued. As you can see from this image, the game won’t even allow me to “stand” as I only have 14. Gotta have a 15 or more if you want to do that. Another awesome place to play Pontoon Blackjack? BigSpin Casino, with it’s 500% Sign Up Bonus if you use the code BSC500, up to $3,000! Also, why not learn how to play Zappit Blackjack as long as you’re here? 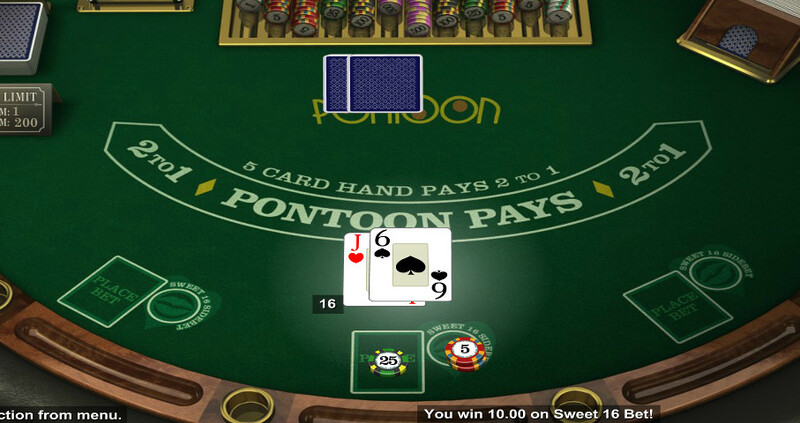 Obviously, Pontoon players are deprived of one of the most important strategic factors, which is the dealer’s up facing card. The players can, however, adjust their tactics to their own hand totals and the number of cards within the hand, as presented in the table below with your total on the left as well as how many cards you have, as represented with the three rows on the right. Some of these words might make Pontoon Blackjack sound like a whole bunch of ‘no fun’. But that’s just not true! Some people are just born risk takers, making all of this part of the experience! The tables above may be a little hard to remember, there is a lot of information going on at any time. But, you are still able to take this along with your own strategy and you’ll be ready to go in no time!